“You do realize that there’s a Darth Vader mask behind your head when you say that?” he said … pointing to the Darth Vader mask propped up on the file cabinet behind me. Star Wars is one of the highest grossing movie series of all time. Nearly everyone has seen the movies and enjoyed them on some level. Some people, however, take it too far. There’s a fine line between owning the movies and traveling to a Star Wars convention in a Stormtrooper costume. I’m aware of that line, and being known as the Star Wars Guy is coming dangerously close to crossing it. While I reject the Star Wars Guy label, I admit to being more than a casual fan of the series. Seeing the original movie when I was 6 years old changed my universe. Having never been in a movie theater before, I was a blank slate, and the groundbreaking special effects combined with the new-to-me ancient mythology captivated my imagination like nothing I have experienced since. I collected the action figures, the ships, and the trading cards. I dressed up as Luke Skywalker for Halloween. My friends and I played Star Wars every day at recess – zigzagging around the playground, blasting each other with imaginary lasers. We waited three years for The Empire Strikes Back, then debated for another three years whether Darth Vader actually was Luke Skywalker’s father. Though we outgrew the action figures and trading cards, we still obsessed over the movies. Not like dorks – just like all the other cool kids in the nation … with Star Wars bed sheets. We were in our twenties when the movies were remastered for theatrical rerelease, leading to another Star Wars revival. These were not just great movies; they were childhood memories, celebrated with childhood friends – cool childhood friends, not dorks, who had grown into cool adults, not dorks. And as new merchandise came out, we started making more deposits in George Lucas’ bank account. I bought some Star Wars posters for my classroom – to connect with the kids, of course. And somehow, that cheap Darth Vader mask seemed too good to pass up. And students loved getting the Yoda ink stamp of approval on their papers – which was nothing compared to the life-sized Yoda my friend acquired for his living room. How he ever talked his wife into that purchase was the ultimate Jedi-mind trick. Nothing is more Star Wars than father-son bonding – as long as it doesn’t involve a severed hand. So when I became a father, I looked forward to introducing the movies to my own children. I went to my parents’ house, dug in the closet, and rounded up my old Star Wars toys. I took them home and hid them in our basement. The plan was to bring the action figures up one at a time as incremental rewards. I tried to hold out with the movies until both sons were old enough to understand and fully appreciate them. She didn’t call me Star Wars Guy, but the between-the-lines accusation was silent and powerful, much like the Force itself. 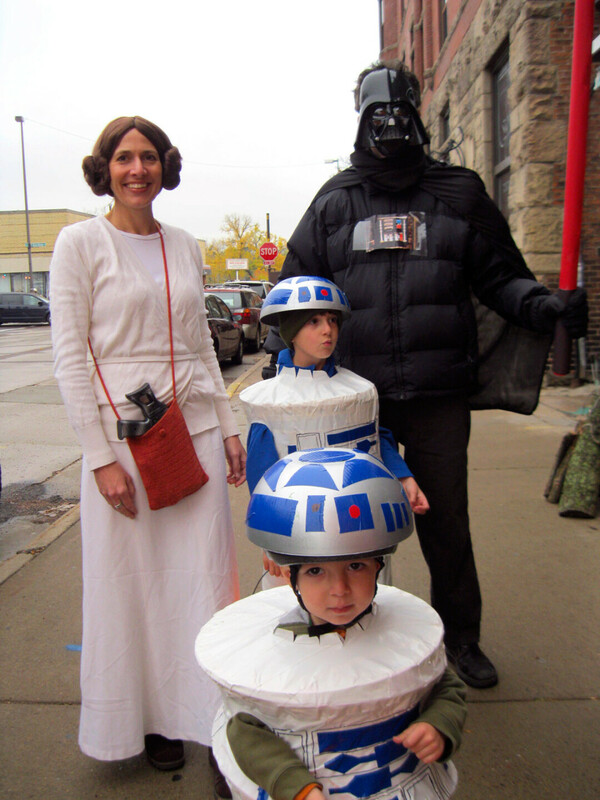 When Halloween came around, someone in the family thought we should go with a Star Wars theme. Both kids wanted to be R2-D2, so we went the simple route: bought some flexible laundry hampers, turned them upside-down, cut out holes for the arms and the head. Then it was just a matter of blue, red, and white duct tape, bike helmets, upside-down popcorn bowls, and spray paint. The kids were a hit. So was my wife as Princess Leia. And with my mask, black winter coat, black pants, and cape, I was an easy Darth Vader. As the night wore on, our oldest son got tired of shuffling around inside a laundry hamper, so he and the princess called it quits and went home. The younger R2-D2 and I soldiered on through the neighborhood. Eventually – fatigued from carrying a plastic pumpkin full of candy with his legs bound by the laundry hamper – he fell over backwards … and then laid there like an upside-down turtle, unable to get back up. However, showing Jedi-like skills, he didn’t spill a single piece of candy from his plastic pumpkin. He couldn’t go on, he said, and he needed me to carry him. I scooped him up – laundry hamper, popcorn bowl helmet, pumpkin container – and hauled him home. It was a difficult journey and probably quite the sight: a horizontal R2-D2 getting a free ride, me breathing like the real Darth Vader, and the two of us looking, unmistakably, like a couple of Star Wars Guys.